This part of the country is as iconic as it gets. Probably most people on the planet have seen images of it either in books or in countless movies, especially the classic westerns. You must have seen them too. I had visited this region just a few years ago so it was interesting to be back. You might ask why come back? Well, it is a bit complicated. 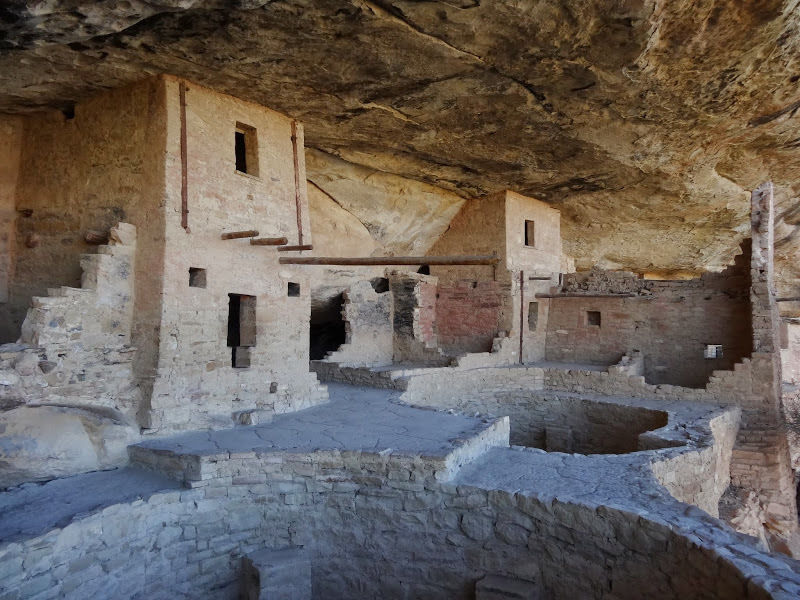 First, I wanted to show my girlfriend (who is an archaeologist) some of the sites associated with the ancient American cultures, namely the Ancestral Puebloans’ ruins in Mesa Verde National Park. But I also like to come back to some places in general. Somehow while revisiting a particular location I do notice more things. I guess the reason for that is the fact that when you arrive at some very exciting destination for the first time it is easy to be overwhelmed and distracted. It is simply too difficult to take it all in. Somehow, a repeated visit is usually less frenetic, calmer, and it simply lets you notice more. It also allows you to see things in different conditions, for example in different weather. 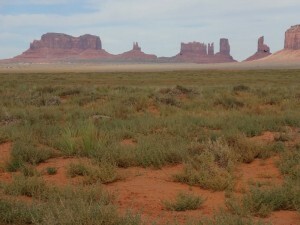 And that’s precisely what I experienced when we arrived at the famous Monument Valley. Two years ago during my previous trip the weather conditions were challenging, to say the least. It was rainy, it was windy and visibility was not too great. Don’t get me wrong, I’m not complaining, I still loved every moment of the experience, it was just different. This year the weather was perfect. Warm, but not too hot, with beautiful sunshine. 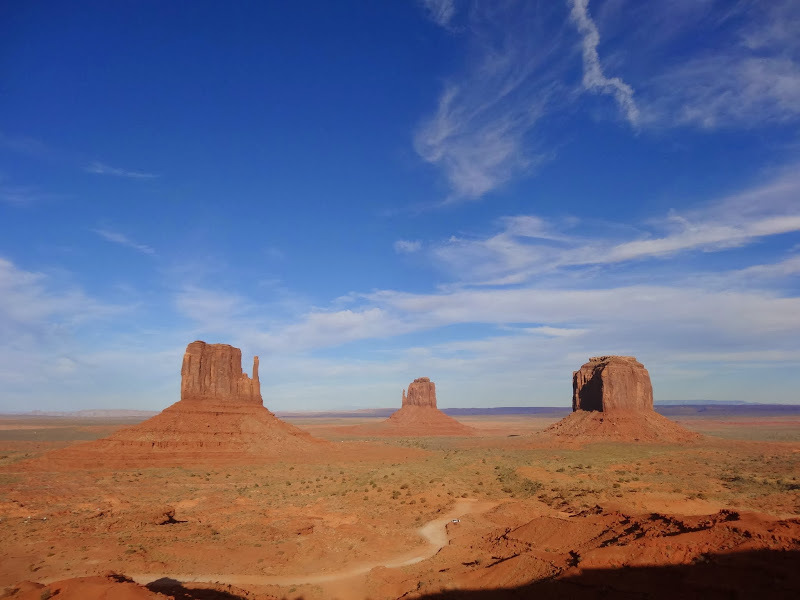 We also managed to arrive at Monument Valley Navajo Tribal Park at the perfect time of day, in the late afternoon not too long before the sunset. 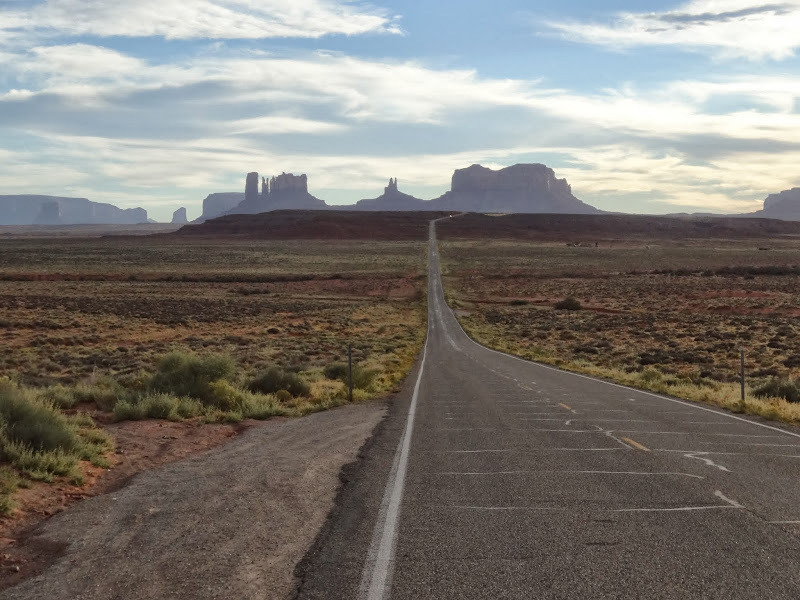 The park is run by the Navajo Nation and welcomes you with an absolutely enormous visitor centre, containing restaurants, gift shops, hotel and a small museum. Don’t linger there too long as it is not really that interesting and it is overrun by tourists from all the tour buses which you will pass on your way there. Give them a wide berth and head straight for the trail. There are viewing terraces right next to the visitor centre but they are full of people with sophisticated cameras mounted on enormous tripods who are trying to take the perfect shot. Hardly any of them walk off the pavement so you will most likely have the trail to yourself. 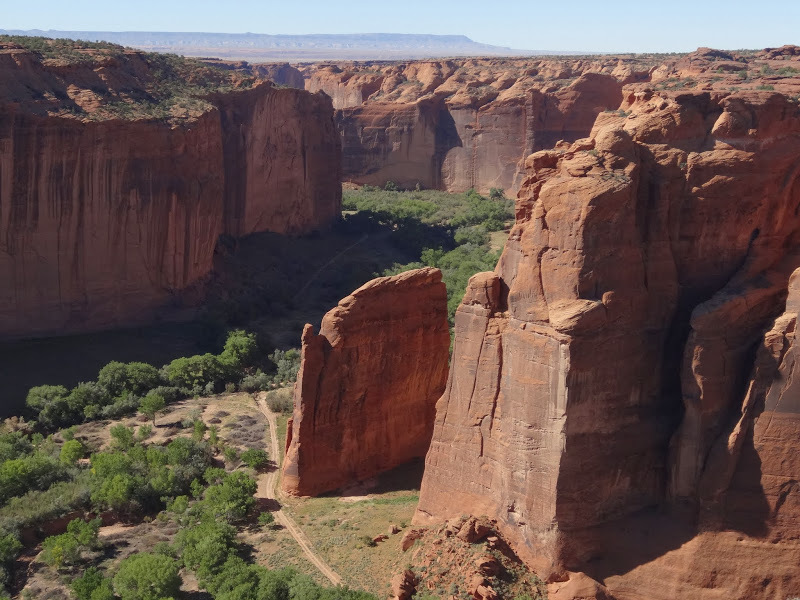 The Wildcat Trail is the only self-guided trail in the park and it runs for 3.2 miles around the West Mitten Butte at approximately 5400 feet elevation. It may take anywhere from 1.5 to 2.0 hours to walk the whole loop. We only walked part of it but it still allowed us to experience the changing vistas as well as get close to the desert environment. And we only saw one more couple on the entire walk. I would highly recommend this hike. There is a scenic drive but it requires navigating some seriously rough dirt road which is not recommended for regular cars. It is also a definite no-no for any rental vehicle like ours. Alternatively you can experience the park with a native guides, either in 4×4 or on horseback. From the park we headed north along the US Hwy163, precisely the route I drove in 2011, just the opposite way. It is a truly spectacular drive, one of the American classics, and we drove it at the absolute best time of the day, just before the sunset. We were thinking about spending the night in some cheap motel in the town of Cortez (another place I have visited before) which is a convenient base for the Mesa Verde. We were still quite a few miles away from it when we spotted the bright lights of the Ute Mountain Casino. As we were getting tired after a long and exciting day we decided to check it out. And it was a great idea. I have to say that the place was one of the best deals during our whole trip. We paid only about $50 for a spacious and nicely appointed room. From my experience similar rooms in non-casino locations would cost probably twice as much, if not more. Once we made ourselves comfy in our room we immediately went back to reception and extended our stay for another night. 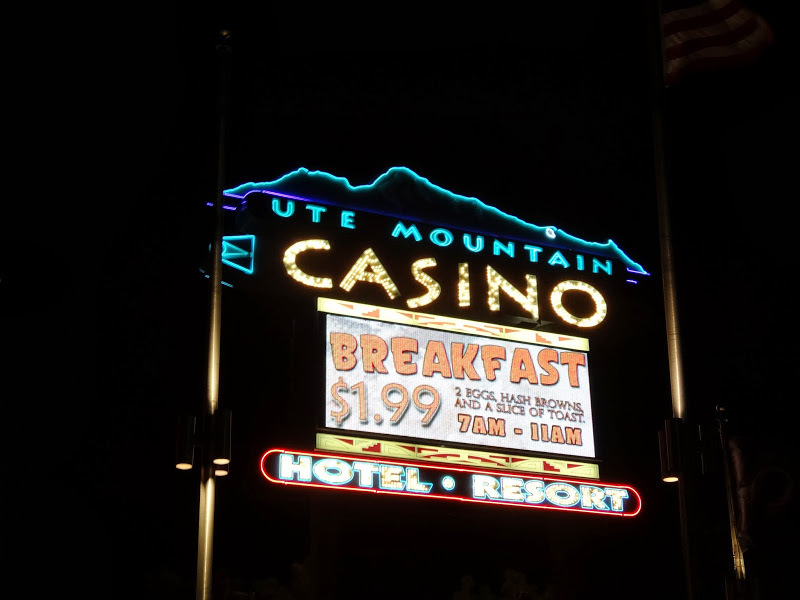 Basically we decided to make the Ute casino our base and to come back the following night, after visiting the Mesa Verde National Park. This is one of the parks which concentrates more on historical sights than on the natural ones. I mean the landscape is still spectacular but the real draw here are the ruins of ancient settlements in the canyons rather than cliffs or the canyons themselves. Our itinerary closely resembled my own one from two years previously. We joined the ranger led tours of the Cliff Palace and the Balcony House, precisely as I did two years previously. You can read more about it in my old blog entry here. However here I have to complain about the quality of the guides/rangers. It was nowhere near to those I experienced in 2011. Back then I was really impressed with the eloquent, funny, lively and knowledgeable old rangers. This year we got two university students which were in fact only part time rangers for the summer. Don’t take me wrong, they were lovely but as guides they were hopeless. I don’t want to boast but I have a feeling that I could have run this tour better if I had read a chapter or two from some basic history book. They provided very little information but they were also really unprofessional. They couldn’t control the time and pace of their tours, spending too much time getting stuck in some, not really important, place while trying to catch up later and speeding way too much along the really interesting and impressive bits. At some point I thought I was going to say something but I didn’t want to be rude. I was reminded of why I don’t like guided tours in general. They can be a real hit or miss. Unfortunately in Mesa Verde it is the only way to see the best sites. After a second night in our favourite Ute Mountain Casino, Hotel & Resort we headed south towards the Canyon the Chelly. By now the US government was in total shut-down and the national parks were closed. 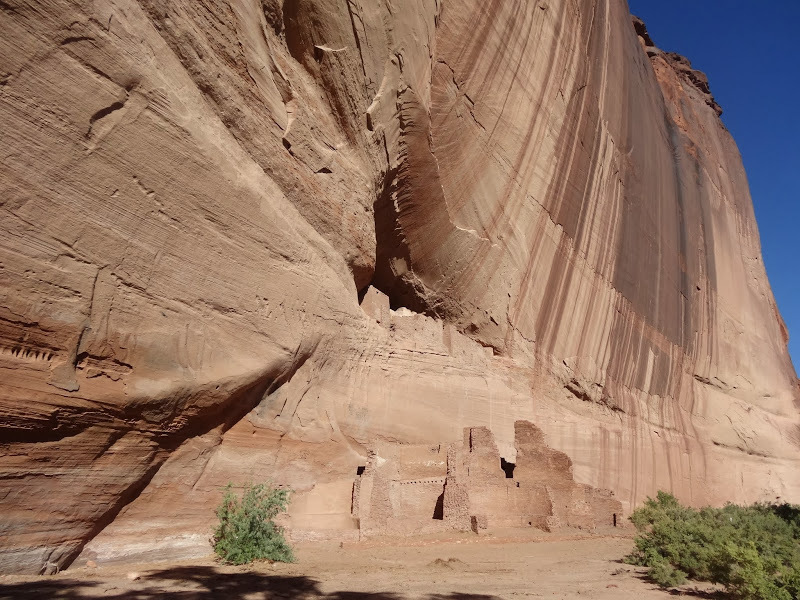 However we were hoping that Canyon de Chelly National Monument will be open as it is run by the National Park Service but owned by the Navajo Nation. And we were lucky. The visitor centre was indeed closed but the scenic rim drives (which are also access roads for the Navajo families living inside the park) were open. Even better, the only public trail which leads down to the canyon floor was also open. It is called the White House Trail and it descends 600 feet (200m) from the parking area to the White House Ruins. It is a great walk which runs next to some steep drop-offs where it has been carved into the sandstone. If you are afraid of heights, beware! The trail also passes through two fairly short tunnels. Views from the trail are spectacular and the natural sculpturing of the sandstone is also unique and fun to look at. The bottom of the canyon has quite lush vegetation, even at the end of a long summer. It is due to underground water flowing there even when the river bed is bone dry, like during our visit. Normally the area around the ruins is quite crowded with all the Navajo-run tours as well as Navajo sellers offering their jewellery and other wares. However when we got there it was all quiet and empty. During our stay only one 4×4 arrived with one noisy family. Luckily they took a few pictures and disappeared almost as soon as they arrived. Perfect. I can safely say that Canyon de Chelly was definitely one of the highlights of our trip across the American Southwest. It is fascinating region well worth repeated visits. It doesn’t matter if it is your first, or second, or even tenth visit, I’m sure you will have fun and find some new fascinating angles to the sites you know as well as discover plenty of new stuff. Places like that are the perfect answer for all those folks who ask me if I’m not getting bored after travelling to the US so much. How can I get bored? Are you kidding me? This entry was posted in Uncategorized and tagged america, Arizona, Canyon de Chelly, colorado, Cortez, Hotel & Resort, Mesa Verde, Monument Valley, Navajo, Southwest, usa, Utah, Ute Mountain Casino on February 25, 2014 by admin.